I have known for a while that in addition to the run-of-the-mill pollen allergies, I’m also allergic to some atypical things: chlorine, sunscreen, makeup, hair dye, MSG, chocolate. It all came to a head last summer when my body became overwhelmed and I finally sought help from the Environmental Health Center in Dallas. The good news is I have more good days now than bad days. But I am on a constant quest to decrease my chemical exposure. It turns out that fabric isn’t without it’s problems from a chemical perspective. The dyes and fixing agents can contain toxins unless more natural options are used. Linen is one of the more minimally processed fabrics, but organic linen clothing is priiiiicey! 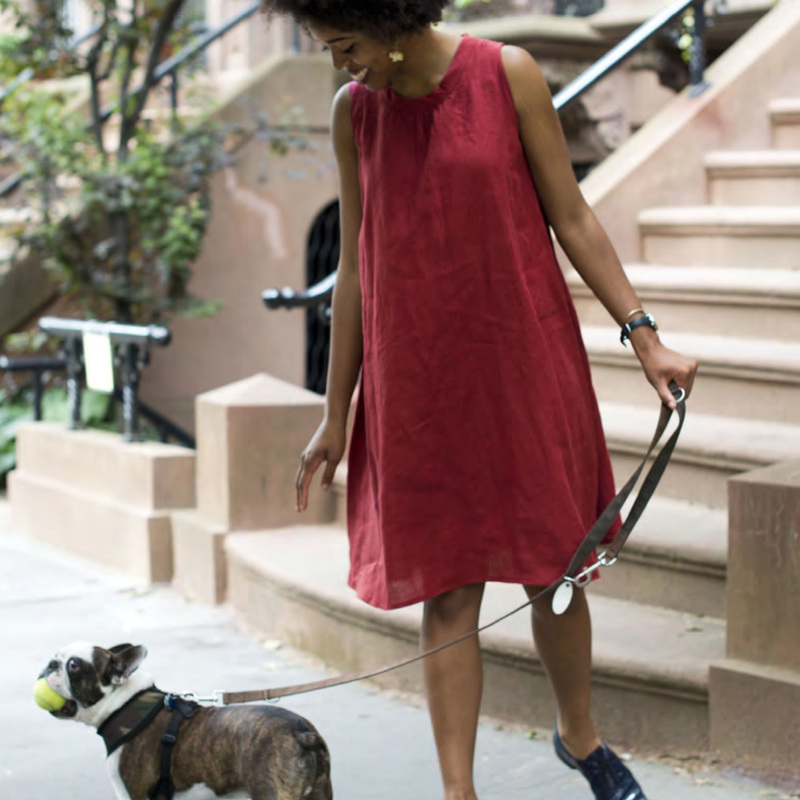 Behold the Kiomi Dress, from Lotta Jansdotter’s book, Everyday Style. At the risk of sounding like a broken record, this dress took me FOREVER. Too much time was spent finding and tracing out the pattern pieces from the chaos that was overlapping lines from different pieces all superimposed upon each other on the same pattern sheet. It was chaos, and one of the reasons I prefer to buy patterns rather than pattern books. Once I got going, the dress was straightforward enough. I will say though, that when it was getting close to being done, I started to get nervous. In my fittings, this dress was looking like a NIGHTGOWN. In an act of desperation, I twisted the dress up tightly until it twisted up on itself and left it in a basket overnight so that it wouldn’t unwind. It wasn’t until this morning when I unraveled this mess of wrinkly goodness that I loved it! I put it on and wore it to church. Then ran around in the back yard while my hubs took pictures. The pattern calls for medium weight linen, but I think I’ll go with a lighter weight for this type of dress in the future. The fabric just didn’t hang well until I twisted it up.